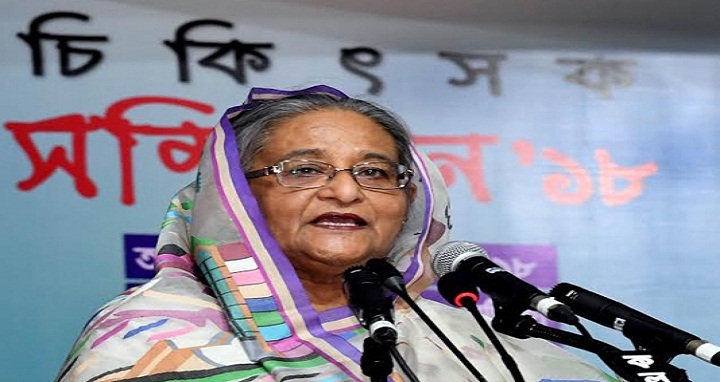 Dhaka, 8 October, Abnews: Prime Minister Sheikh Hasina today said her government, if elected for another term, would set up a medical university in every division. Besides, the government has taken a plan to construct multistoried buildings in the upazila headquarters to facilitate the doctors of the upazila health complex to live there, she said while addressing the Doctors Conference-2018 at her Gonobhaban here this afternoon. She said construction of modern buildings for Dhaka Medical College and Hospital (DMCH) is going on to replace the dilapidated ones. Sheikh Hasina said her government with limited resources has made the best stride to reach healthcare services to the doorstep of the people. Government has also tried to reach modern healthcare services to the district and upazila levels so people get specialized treatment at home. Sheikh Hasina laid importance on modernization of the curriculum of the private medical colleges to produce efficient doctors. Health Minister Muhammad Nasim and State Minister for Health Zahid Maleque attended the function as special guests while president of the Confederation of Medical Associations of Asia and Oceania Dr Ravindran R Naidu was present as the guest of honour. President of Bangladesh Medical Association (BMA) Dr Mostafa Jalal Mohiuddin was in the chair while Vice Chancellor of Bangabandhu Sheikh Mujib Medical University (BSMMU) Dr. Kanak Barua and secretary general of BMA Dr. Ehtashamul Haq spoke among others on the occasion. Responding to a 16-point demand placed by BMA in the conference, the prime minister said her government, if elected for the next term, would consider those with high importance. “We want to build a Bangladesh where people will have access to their all basic needs including healthcare services. 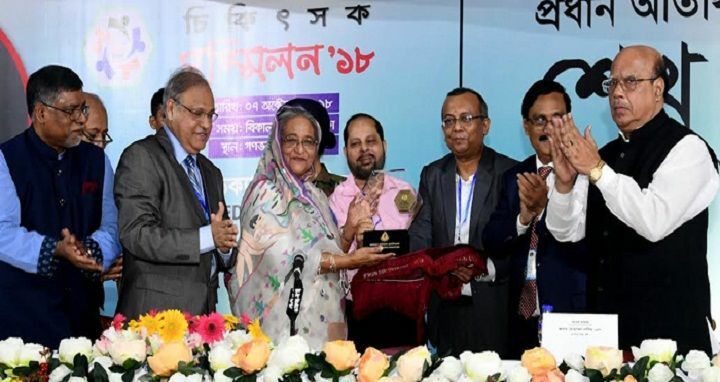 It’s the duty of the state to make sure that people get medical services and have access to nutrition,” she said adding that Father of the Nation Bangabandhu Sheikh Mujibur Rahman had incorporated the provision in the constitution. Sheikh Hasina said Bangabandhu had elevated the status of a physician to first class from second class. Bangabandhu also introduced many higher medical institutions and courses within a very short time. The rulers after his brutal killing did nothing for further development of the healthcare services. She said the first medical university was established by her government in 1996 with the aim to create competent physicians and technicians in different fields of medical science. The government has established institutes for treatment of kidney, cancer and diseases of the nerves, ENT and eye, burn injuries and for plastic surgery. They were also aimed at producing post graduate nurses to provide high quality nursing services. The prime minister said three more medical universities are being constructed in the country while 42 government and 69 private medical colleges were established in addition to 28 public and private dental colleges. All upazila health complexes were upgraded to 50-bed hospitals while 100-bed district hospitals were turned into 250-bed and 500-bed on the basis of the need of the local people, she said. People are getting healthcare services from around 18,500 community clinics and Union health centers across the country while 30 types of medicines are being distributed for free. Bangladesh’s success in reducing the maternal and child mortality rate was acclaimed by the global community, she said. The prime minister said her government has formulated the National Health Policy and National Drug Policy along with enactment of the human limb replacement act. A total of 12,000 doctors were recruited and more remained under the process of recruitment so that people get medical services from the government hospitals.